Chicagoans are experiencing the golden age of restaurants and food culture right now as new restaurants with amazing food options continue to open practically every week! Over the past month I’ve had the chance to try several places that are new (or updated) to the Chicago food scene. BBQ, sushi, candy, and lobster all make an appearance and demonstrate just how diverse Chicago can be when it comes to food. Check out my mini-reviews below! I’ve always been impressed with Ra Sushi’s maki rolls but because I am a creature of habit, I typically end up ordering my standard sushi favorites and rarely branch out to the rest of their menu. When Ra asked me to come in and try some of their new spring menu items, it was a great opportunity to taste dishes I’d normally pass over. First, let me tell you how much I loved their spring cocktail list! I tried the peach basil sour made with Bacardi peach red, St. Germain elderflower liqueur, fresh basil and lemon sour. A drink like this at a hotel bar would cost upwards of $14 and at Ra it was a reasonable price of $8.50. Tuna California Roll: classic California Roll topped with a tuna mix of avocado, cucumber, bell pepper and cilantro; finished with togarashi, garlic chips and black pepper soy sauce. My favorite part of both the seabream carpaccio and nigiri was the yuzu dressing! It added the perfect citrusy snap to the fish and broke down some of the chewiness. I loved the creativity of the tuna California roll with the garlic chips and black pepper soy sauce; not to mention combined two of my favorite classics, spicy tuna and a California roll! In addition, RA Sushi will host its largest annual fundraiser, “Nicky’s Week,” from Monday, May 25, through Sunday, May 31, to help kids battling cancer and other life-threatening diseases. In its 11th year, the weeklong fundraiser benefits St. Jude Children’s Research Hospital® During Nicky’s Week, RA Sushi will donate 100 percent of sales from a variety of menu items and beverages to St. Jude to help support the hospital’s lifesaving mission. If you’re planning on eating sushi anytime between May 25 and May 31 stop in Ra and help make a difference! The newest Dinosaur Bar-B-Que location opened in Chicago a few blocks from the Clybourn red line stop in Lincoln Park. Their huge venue boasts two floors and an amazing patio that’s sure to be packed as the weather warms up. I had a chance to attend Dinosaur’s opening party and try several of their slow-cooked meats and some super flavorful sides. My favorite appetizers were the jumbo BBQ chicken wings which are spice-rubbed, pit-smoked and then finished on the grill. The wing’s I sampled were glazed with smoky-sweet honey BBQ sauce that had just a hint of spice. I also really loved the jerk lamb shoulder slider; I hadn’t had anything like it before so it was a pleasant surprise. My favorite “meat” of the evening was the giant bar-b-que pork ribs. There was a TON of tender meat on the bone that fell off as soon as your teeth touched it. I loved that the ribs were both spice-rubbed and then also basted with Dinosaur’s original BBQ sauce. My personal winner for favorite dish of the night went to the mac and cheese! It was infused with a smoky BBQ flavor that I’d never encountered before, and the noodles soaked up all the cheesy goodness! 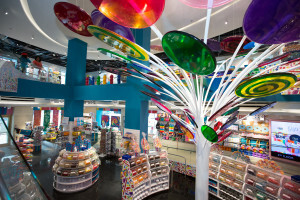 If you’re a candy freak like me, then you’re sure to love the new Dylan’s Candy Bar on Michigan Avenue. I have a special place in my heart for items such as tape gum, sour patch kids, rock candy and more. Luckily all these items on top of hundreds of more choices can be found at Dylan’s. The other day I had a chance to go in and check out the two-story candy playground in the company of Dylan Lauren herself as well as her father Ralph Lauren at the official launch party! Delicious candy-themed cocktails, sweet and savory bites and a whole candy bar made me feel like I had won the golden ticket at was in Willy Wonka’s factory. And just like a true “kid in a candy store” I ended up making a scene as I knocked over a giant lollipop balloon display trying to get the gum balls out of a giant clear plastic tube. I nearly died of embarrassment! Apparently you can’t take this kid to the candy store without a scene and I’m thinking that I should really steer clear from the “free candy” from here on out! For some reason lobster rolls always remind me of summer, so Luke’s Lobster’s arrival in Chicago couldn’t have come at a better time! Not only does the East Coast chain serve a mean lobster roll, but they also have crab or shrimp rolls which cost a little less, as well as crab claws, grilled cheese, New England clam chowder and some delicious sides. Oh, and I can’t forget the Bang Bang honey pie topped with blueberry compote they have for dessert! I can be pretty picky about my lobster rolls (I hate when they are drowned in mayo) and was super happy that Luke’s was served chilled atop a buttered New England-style toasted split-top bun with just a swipe of mayo, a sprinkle of lemon butter and a dash of their secret spices. The result was a light tasting roll that really brought out the natural sweetness of the lobster. I also loved that the lobster was not chopped too thin and you could see whole claws and big chunks of lobster meat. With the little seaside-themed restaurant walking distance from my office I plan on making multiple stops there this summer!